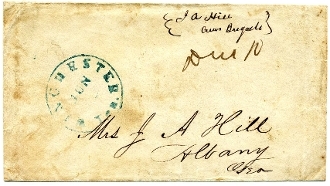 Crew's Brigade (2nd, 3rd, 4th Georgia Cavalry & 7th Alabama Cavalry) soldier's cover with blue Winchester, Tennessee postmark June (1863) and manuscript "Due 10" to wife. Scarce town. Crew's Brigade was in Wharton's Division of Wheeler's Corps. Fine.